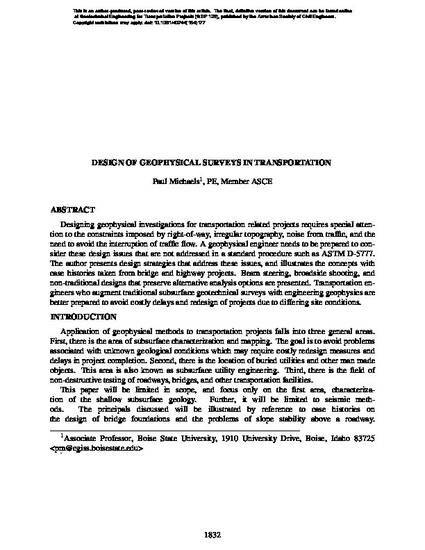 Designing geophysical investigations for transportation related projects requires special attention to the constraints imposed by right-of-way, irregular topography, noise from traffic, and the need to avoid the interruption of traffic flow. A geophysical engineer needs to be prepared to consider these design issues that are not addressed in a standard procedure such as ASTM D-5777. The author presents design strategies that address these issues, and illustrates the concepts with case histories taken from bridge and highway projects. Beam steering, broadside shooting, and non-traditional designs that preserve alternative analysis options are presented. Transportation engineers who augment traditional subsurface geotechnical surveys with engineering geophysics are better prepared to avoid costly delays and redesign of projects due to differing site conditions.